Bakutel 2018, the 24th Azerbaijan International Telecommunications and Information Technologies Exhibition and Conference will be held in Baku from the 4th to the 7th of December. The exhibition will mark the beginning of High Technologies Week. Today Bakutel goes beyond being an ordinary exhibition in the area of technical achievements; it has already become a unique platform where experts and professionals from various ICT fields gather to offer ample opportunities and the latest developments for all fields of activity that play an important role in ensuring economic sustainability, social well-being and in further raising the living standards of the population. The exhibition has the support of the Ministry of Transport, Communications and High Technologies of the Republic of Azerbaijan, ITU - International Telecommunication Union, Regional Commonwealth in the field of Communications (RCC), Azerbaijan Fund for the Promotion of Export and Investment (AZPROMO) and the National Confederation of the Entrepreneurs (Employers) Organizations of Azerbaijan Republic (AEC), Small and Medium Business Development Agency of the Republic of Azerbaijan. The organiser of the exhibition is Caspian Event Organisers (CEO). 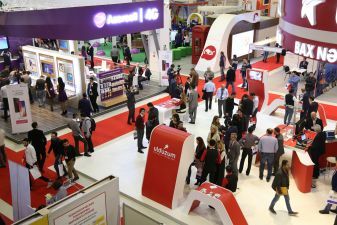 This year Bakutel 2018 expects over 200 exhibitors from 20 countries worldwide, including leading ICT companies, mobile operators, Internet providers, system integrators, distributors of well-known brands and young developers. The exhibition will welcome national stands of such countries as Italy, Iran, Turkey, the United Arab Emirates, the Republic of Belarus, the USA, Slovenia, France and Croatia, whose participation is now possible thanks to an active support of the Ministry of Transport, Communications and High Technologies of the Republic of Azerbaijan. This year’s exhibition will turn into a real festival of innovations; Bakutel 2018 will present IT solutions of new generation for banks, urban transport, retail, Smart City systems, 4-5G mobile technologies, services in the field of fibre-optic and cloud technologies. Moreover, about 40% of the total number of participants will be permanent exhibitors of Bakutel. The list of participants is replenished annually thanks to new companies onboard; so, among this year’s debutants are Silk Way Business Aviation, the State Advertising Agency of Azerbaijan (ADRA), Systematics (Russia), Suntech (Poland) and many more. For the first time, Silk Way Business Aviation will feature a new laboratory for the ATR 42-500 aircraft at its stand; a novelty for this vessel is its new feature - a geodetic survey which is performed on the Sokkia GRX1 equipment using the real-time kinematics (RTK). Also, about 100 Azerbaijani start-ups will take part in the exhibition to present their innovative ideas for various fields of activity, such as tourism, ecology, hospitality, accounting, and much more. An impressive part of the development is based on the use of virtual and augmented reality technologies. The new direction of the exhibition will be the involvement of small and medium-sized businesses and private technology developers to solve problems in various fields - from oil to entertainment - to help them promote their business. This direction is being developed with the support of the Agency for Development of Small and Medium Entrepreneurship of the Republic of Azerbaijan. Various business events are planned for the entire duration of the exhibition; these include B2B meetings and speeches on current topics. During the exhibition, a Presentation Zone will be arranged for technology developers and material manufacturers to present their products and projects. In addition to business meetings and negotiations, a number of surprises, contests and quizzes await all visitors and exhibitors of Bakutel 2018. For the first time, the fastest goalkeeper in the world, Robokeeper, will be demonstrated at Bakutel 2018. Robokeeper is an innovative invention of German scientists and has already stolen a way into hearts of all football fans around the world. No matter how hard and fast you hit the ball – this smart goalkeeper will almost certainly save it. At the exhibition, visitors and guests of the exhibition will have the opportunity to test Robokeeper for its goal-saving ability; anyone who can score a goal will receive valuable prizes from Azercell, as well as footballs from Allof. The Bakutel exhibition will provide everyone with the opportunity to learn about the best industry achievements and technologies and to find new partners and investors, as well as effective solutions for the development of their business.